The 2017 Perth International Art Festival highlight to date is Russian director Dmitry Krymov’s Opus No. 7. Consisting of two discrete works separated by an interval, the work is a meditation on the fraught career of compromised Soviet composer Dimitri Shostakovich. A recording of Shostakovich’s enthusiastic address to the Congress of Soviet Composers is counterpoised with images such as a giant babushka puppet—at once standing in for Stalin, Mother Russia and Shostakovich’s mother—taking pot-shots at a diminutive incarnation of the composer, who flees across a circus-style stage while large-scale photographs of his condemned compatriots (like theatre maker Vsevolod Meyerhold) waltz about him. Shostakovich’s biography has received many renderings (notably the superb film Testimony, 1988) and Krymov’s poetic images here are not especially dense. As in agitprop, they communicate in a single gesture (Shostakovich is pierced through the body with the pin of a massive Order of Lenin) and gather little over time. Even so, the sight and sound of rusted metal pianos on wheels careening into each other like incensed battle-tanks in an even more literal incarnation of Shostakovich’s 7th Symphony (1941), a memorial response to the Siege of Leningrad, gives much to muse on, even where the images are not always complex. This is not true of Act 1 however, which is a semi-continuous series of mnemonic acts in homage to the dispersed Yiddish Ashkenazi and Sephardic populations of the Russian Empire, mostly from Ukraine. In the Australian context, Act 1 is almost a companion piece to Barrie Kosky’s Gilgul Theatre productions like The Wilderness Room (1994). 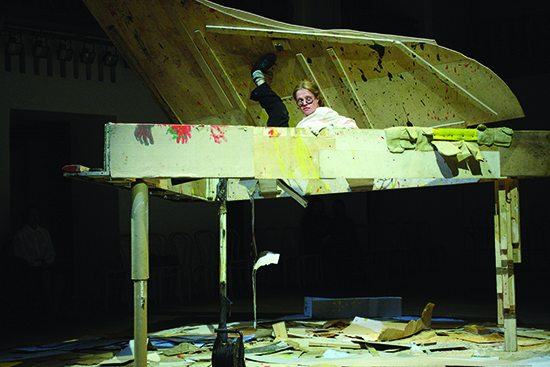 As in the latter, a blend of melancholy and magical summoning arises from the manipulation of simple objects such as cardboard (a rear wall through which arms, objects and cast members protrude, depart, and out of which rough shapes are carved with knives), old photographs (laid out in a corridor across the front of the performance space), shambolic but skilled musical motifs (tuba, song and the percussing of the stage wall), tins of black paint, staple-guns, a blizzard of torn newspapers (the cast pick through them and read the Jewish names they find on each), a rickety pram violently rolled across the floor (an ironic reference to Battleship Potemkin, 1925), and the now inescapable symbol of pogroms old and new: abandoned shoes, such as those that piled high at Auschwitz. Opus No. 7 is unashamedly a work in the tradition of the Theatre of Attractions, a model enunciated by Meyerhold, Eisenstein and Tretyakov in the heady days immediately after the Revolution as a theatrical style for the masses. Akin to Dada, the mode is one of opportunistic juxtaposition and montage of what in the 1920s were mass entertainments: popular music theatre, boxing, cabaret, acrobatic skits, cinematic interludes and periodic surprises. A particularly affective such moment in Opus No. 7 occurs when the set’s rear panels become screens for the projection of photographs of wizened men in long black coats and fur hats. As at the first screening of a moving image by the Lumière Brothers in 1895, what we initially mistake for a still slowly comes to life as images stutter into mobility. A voice-over commences: thickly accented men talk about their woes, about who is left and who has gone. Using scraps, the performers gesture towards these lost presences, but the fragmentary nature of Krymov’s mise-en-scène prevents their restoration. Mikhail Umanets, perhaps the star of an otherwise ensemble performance, comes forward to tell us about the relatives shown in the photographs on the floor. His impressionistic biographies offer a taste of their personalities, a sense of idiosyncratic behaviours, but only in pieces. Indeed, when a sense of presence does flood the stage, it somehow seems too much to be borne. Memory here is not only an obligation, but a pain itself: memory is cruel. 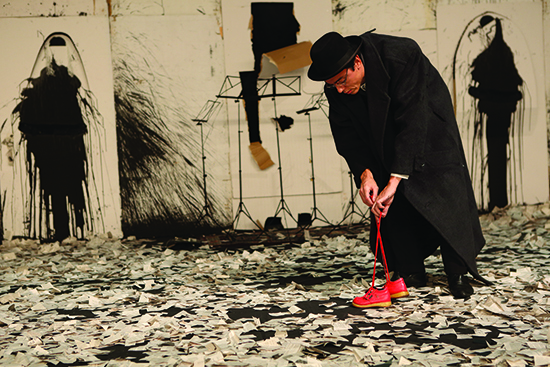 Umanets takes a girl’s pair of red shoes and animates their delicate steps. Performers paint silhouettes of dead children on the wall, beside which Umanets stands, hopelessly and absentmindedly dropping his hand to grasp that of the painted figure. In a moment beautiful and horrible, a painted arm literally peels off the wall and reaches into his fingers. Neither the children nor the old men will come back. We are left with a performative scar. Significantly, the lone woman who greets the audience in the opening, amusedly sweeping the floor (and its past) clean, later unbuttons her comically massive coat to reveal her pregnancy, before singing exquisite—but also tragically isolated—notes. If hope exists, it lies with these Sarahs upon whom the Jewish line depends. While Act 2 concludes with Mother Russia literally smothering her offspring, it is these mothers-yet-to-be of Act 1 who, simply by being among the cast, suggest rebirth. By scenographically reinventing a central aesthetic dream of the Revolution—the Theatre of Attractions—Dmitry Krymov stages an unbearable history of violence, repurposing an otherwise tarnished toolkit with which to attend to this same history. 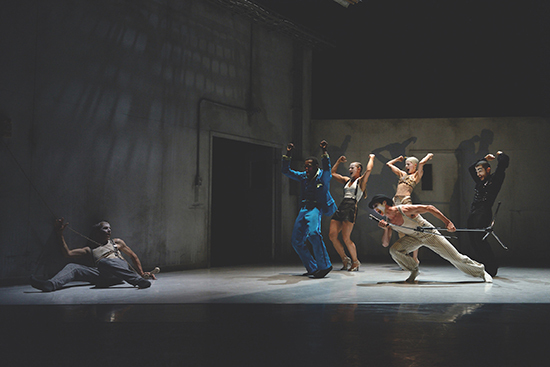 Working through trauma is the explicit subject of Betroffenheit (Canada). A collaboration between Canadian choreographer Crystal Pite and actor dramaturg Jonathon Young, it draws on Young’s personal experience of the loss of a child. He appears onstage, mocked and enticed by a cast of white-faced provocateurs as he recites a series of excoriating observations regarding the destructive, addictive patterns of behaviour into which he has fallen. Recalling Existentialist classics like Sartre’s No Exit (1944), Act 1 occurs in a grey, prison-like room. However, this sparse scenography houses melodramatic outpourings. As in Fellini’s 8 1/2 (1963), images from circus and vaudeville provide a conduit for nightmarish recollections and extroverted dreaming. The piece is accompanied by voice-over narration and sonic rumblings which do not speak for themselves; every key word or emotional jolt is underlined by exaggerated gestures such as clownish frowns or arms reaching to the sky in mock horror. The intent is presumably to pummel Young’s character (and us with him) into the broken figure left after traumatic loss. For me, Betroffenheit works best when it reflects a faith in its own expressive language such that choreography or text are allowed to communicate on their own terms, without hyperbole. The more restrained opening shows an isolated Young speaking back through a microphone to a recording of himself, which demands that he acknowledge his behaviour. In Act 2 the body speaks without text, via repetitive ticks and distorting vortexes into the floor, as dancers scatter across the now void-like, black stage. Elsewhere however, Betroffenheit is close to a David Lynch spoof. To paraphrase Tom DiCillos’ film Living in Oblivion (1995), who really has nightmares which feature carnival dwarfs or white-faced 1920s clowns? Or are they only found in derivative post-Expressionist performance? 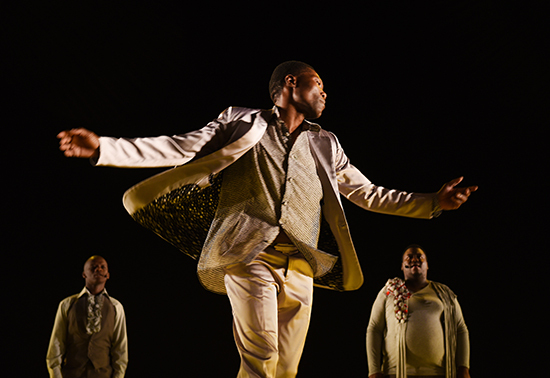 Exit/Exist is low key by contrast, its content and dramaturgy largely carried by South African dancer Gregory Maqoma. He is accompanied by guitarist Giuliano Modarelli as well as a four-piece choir performing mostly in the “isicathamiya” mode developed by Zulu urban migrants in the early 20th century. Considerable vocal material is delivered as Xhosa-language voice-overs as well as in song. London audiences found subtitles distracting, so none appeared in Perth. Consequently the narrative of Maqoma’s 19th century forebear—Xhosa leader Maqoma (1798-1873) who resisted the British expropriations of land, cattle and grain—is rendered opaque. Scenes function instead as meditative tableaux in the manner of Raimund Hoghe’s solos like Another Dream (2000), in which a simple ritual or choreographic gesture is explored and repeated, beginning gently before gathering force. Exit/Exist is close to performance art in its slow build of unadorned action, and is perhaps too long and ill-suited to the large State Theatre. My patience was strained by repeated, belaboured gestures and songs of pathos, which presumably dramatised Chief Maqoma’s imprisonment and death. Appreciated on its own terms though, Exit/Exist is a beautiful, modest work, notable for its sense of cultural fusion. Post-Apartheid South Africa has struggled to reconcile Zulu with Xhosa (both of whom share much as Nguni peoples). The two cultures come together here, along with postcolonial and trans-African influences. The music of Modarelli and the quartet draws on Christian polyphony, Zulu “isicathamiya,” Xhosa song, South African township music, as well as Ghanaian “highlife” and Nigerian “ju ju”—the latter audible in Modarelli’s plucking, which recalls the transposition of kora (West African harp) onto electric guitar. Maqoma’s choreography enhances the sense of stasis. His passages across the stage are infrequent; he largely stands in a loosely defined area, fluidly exploring its modest kinesphere. A dramatic stare from a barely moving face contrasts with hips snaking side to side or feet lifting even as the torso is held stable. Signature dance movements—such as seen in Zulu dance—appear intermittently, such as raising a leg straight up in front of the torso before swinging it down in a single arc as arms swing to where the leg had been. Maqoma pauses to change from a golden ‘sharkskin’ suit into a cowhide tunic while holding horns mounted across his knuckles with which he scythes and gestures. I imagined a cultural return of Martha Graham’s use of what she characterised as the “primeval” dances of tribal cultures and ancient Greece in works such as Errand Into the Maze (1947). Rather than Graham’s focus on the eruption of repressed psychosexual energies, here Maqoma almost queers his more contemporary performance, his stochastic gestures and blank opacity suggesting something both pained but also distanced, approaching camp aesthetics. Compared with how Graham and now Pite and Young in Betroffenheit attempt to bring groaning ghosts into direct communion with their audiences, Gregory Maqoma’s insistence on filtering history through flat, stylised symbols seems more sensitive. I am indebted to Tom Gunning’s essay “The Cinema of Attraction[s]” (1986) which draws on Eisenstein’s account of his collaboration with Tretyakov on their performance “Enough Stupidity in Every Wiseman” (1923) and which Eisenstein published as “Montage of Attractions” (1923).